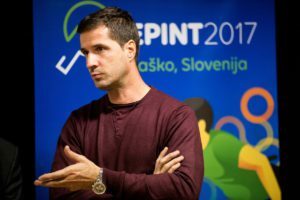 Roman Pungartnik, an excellent former hanball player, has been working with the Sports Federation for the Disabled of Slovenia Paralympic Committee for quite some time now. In his handball career he gathered 165 games and scored 673 for Slovenian national team. He also played at the Olympic Games in Sidney in 2000. He ended his career in 2010 and focused on sport-marketing-oganizational bussiness. Here he found a common ground with NPC Slovenia. He has already helped with the organization of EPINT 2017 last year and now the cooperation continues. “The organizational team of the tournament is well-coordinated and the tournament is carried out perfectly. If any problems appear, we are here to solve them. The greater part of the time and energy are being channeled into the organization of World Championship,” said Pungartnik, who added that in his region they were all surprised how well he found himself in the world of sports for the disabled.